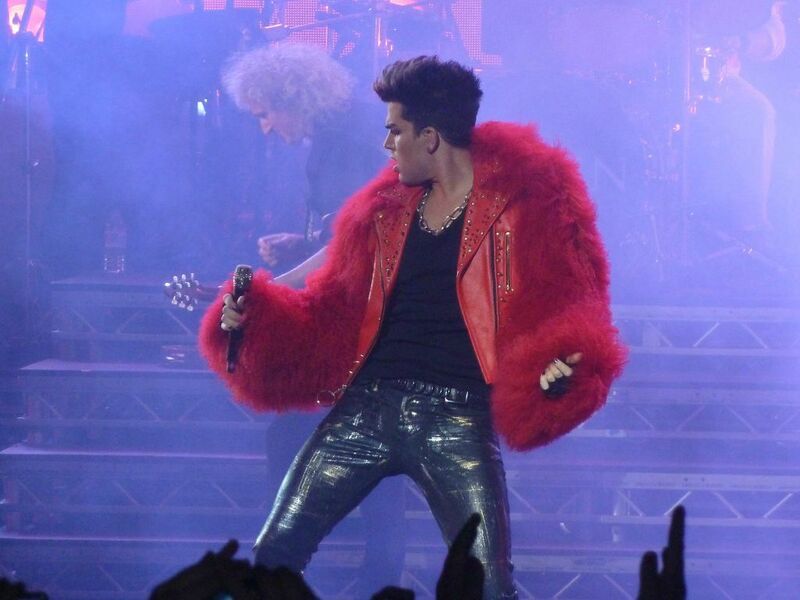 Yourself Alive, We Will Rock You (fast) and Fat Bottomed Girls. Promotional Multicamera Video of Queen + Adam Lambert. Under Pressure, I Want It All. I Want to Break Free, Another One Bites the Dust. Radio Ga Ga, Crazy Little Thing Called Love, The Show Must Go On. Bohemian Rhapsody, Encore -- Tie Your Mother Down, We Will Rock You, We Are the Champions. Video Dragon Attack!! 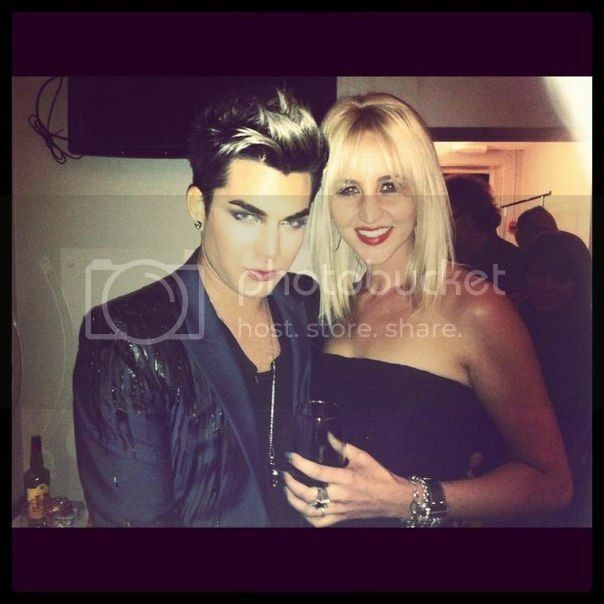 Small clip adam lambert is so hot , he grab brian's arm!! Another one bites the sudt!!video! Video show must go on shirt clip, crowd is wild!! 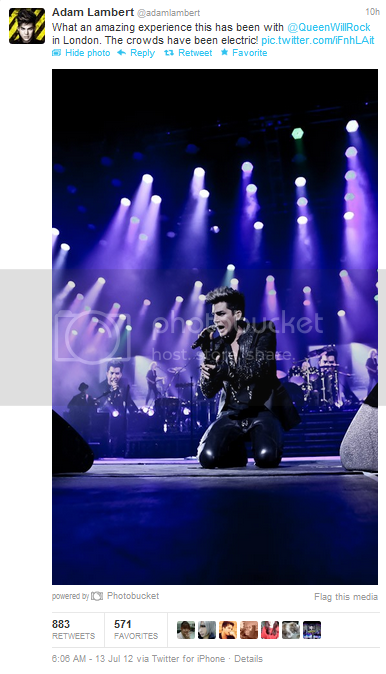 of the London Day 2 FLAC files. 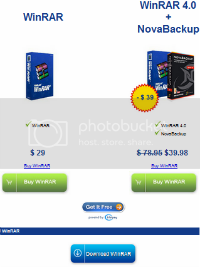 You can unzip the files with WinRAR. button at the very bottom of the page. audio (BEST) that uses some audio from @kyo_jp's tape. You can play the FLAC files (without converting) on a VLC Player, if it is not your default player. 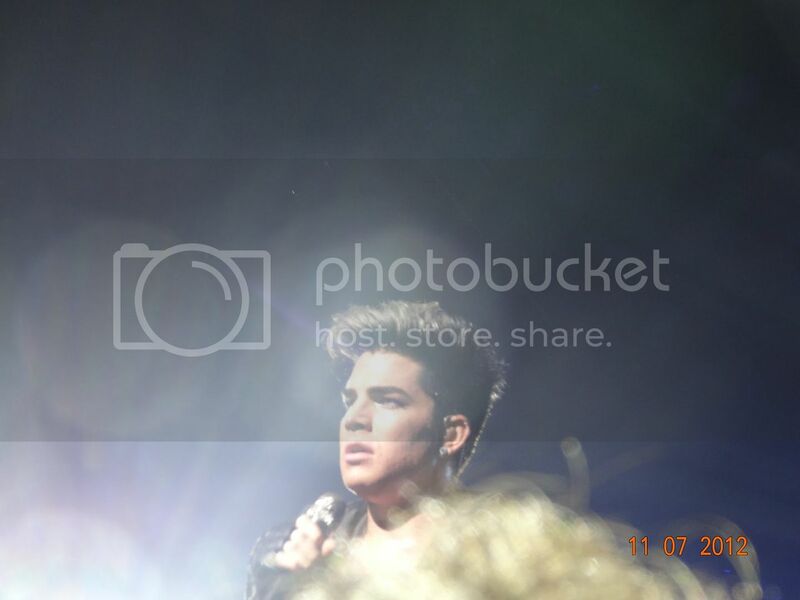 Thank you @adamlambert for making my job such fun! 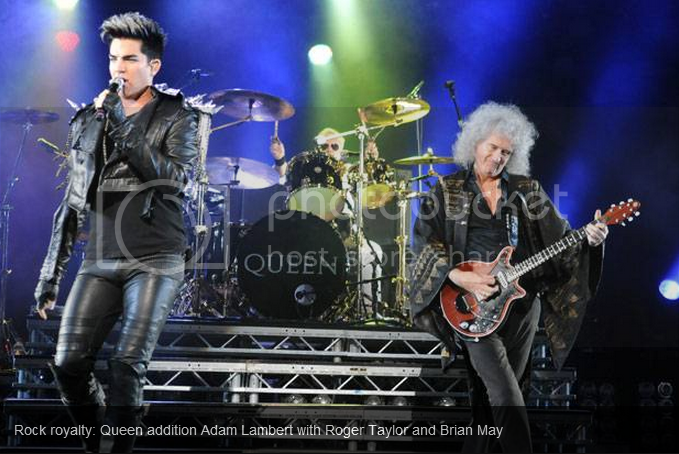 Was such a hoot shooting Adam, Brian and Roger tonight. 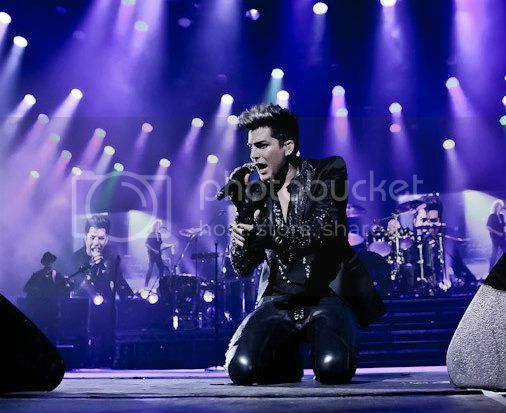 QUEEN AND ADAM … THE BEST SHOW ? 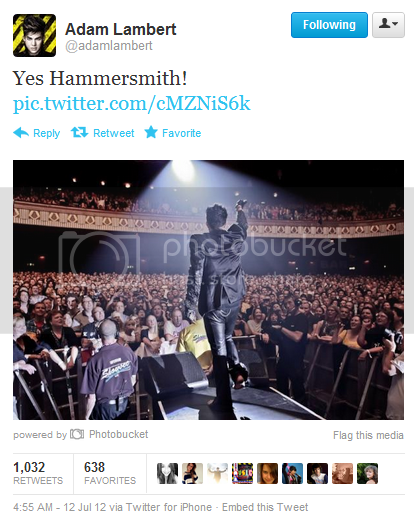 Well, I think we all felt the last couple nights in Hammersmith have been a moment of significance. In fact, perhaps especially last night. 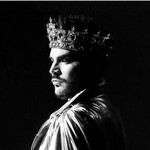 The band, as it is now, seems suddenly to have switched into a higher gear - more confident, having more fun … and stepping into new territory … an amazing thought at this stage in our lives and in our careers … to be honest, I would never have thought it possible before this journey with Adam Lambert began. 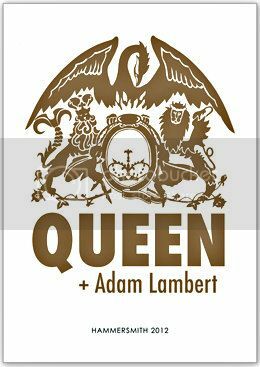 Adam has his own style and path, and there was never any intention that he would be 'another Freddie" - but there are many parallels, in the mechanisms which we've already developed - coming together as an organic band. It's very pure - having no extra guitarist means I am back in the old place, as in the Old Days, completely responsible for holding up the 'wall' of sound, but also completely free to control the dynamics and 'feel', working more or less as a four-piece - something which is only possible because Adam is such a strong pivot and front-man. No backing singers - no dancers - it's pure - somehow it feels like Rock ought to be … … dangerous and stimulating. It's completely - real. In this epoch of auto-tune and hard discs on stage, that's pretty rare these days. And everybody seems to be having fun. Including … totally … US! 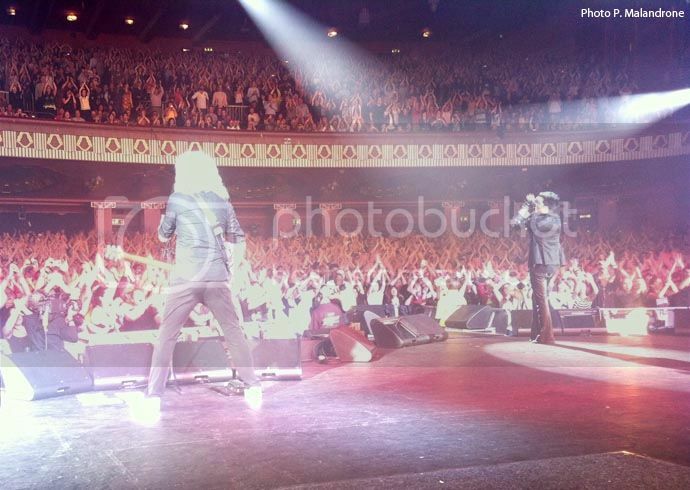 Many thanks to you guys in the Hammersmith audience - no bunch of rockers could be more supportive and inspiring. The view above is something nobody else sees … it's from Pete Malandrone … my intrepid and unflappable Guitar Tech - this is the amazing sight from the Apollo (Odeon) stage - you guys are beautiful !! is some kind of biological experiment to build the ultimate rock god. Last night the power dynamic tipped in favor of the audience in terms of energy, love, welcome flowing toward the stage and synchronized responses while our more effervescent, brilliant, humble rock ingenue took the stage. Tonight our impish dark prince of the glam tribe strode onto the stage and immediately took control like a higher being on a sugar high. (which is all fun until someone's leather pants get torn ). Listening to TSMGO live is an experience out of this world!!!!!!!!!!!!!!! The crowd tonight was 65-70% older men Queen fans And the crowd in general was a Queen crowd. And the young men Queen fans were dancing and clapping like crazy too and EVERYONE was flailing!! 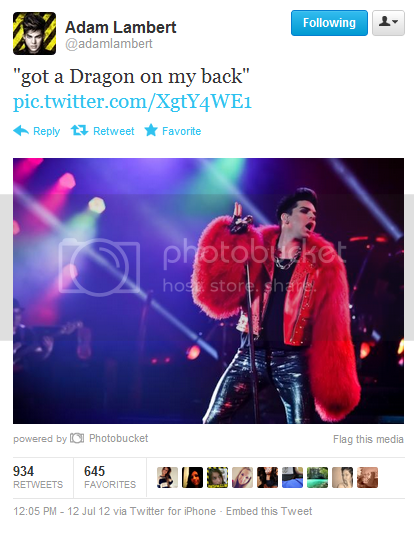 That's why Adam tweeted in the middle of the show, he FELT IT GUYS!! HE FELT THAT ENERGY OMGGGGGGGGGGG!!! 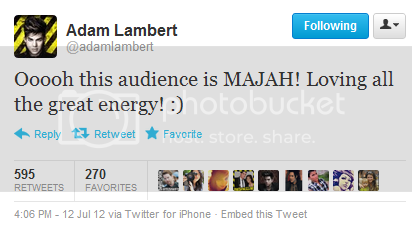 I can guarantee you that after the first 10 minutes Adam had them ALL on the palm of his hand!!!! 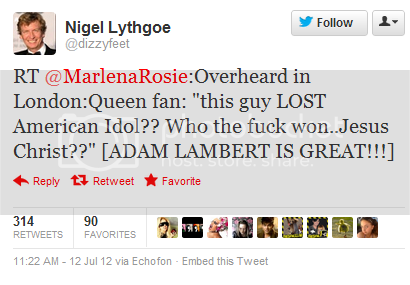 Every time Brian mentioned Adam's name they were clapping like crazy!! OMGGGGGGGG and I saw this live!! THE BEST CONCERT EVAH!!!!!!!!!!! The last note on We are the champions and he ended the whole show of course with this note WAS UNFUCKINEPICEPICEPIC!!! I'm sitting on the plane for Hong Kong, the cabin door closing. But if there is a ticket to the concert tonight in front of me right now, I won't have a second thought about jumping off the plane and head straight to Hammersmith. Well. Breath. And write something down. I can die RIGHT NOW. Not just in a I-have-checked-my-bucket-list-and-can-now-rest-in-peace kind of way, but because I have had the best two and half hours in my entire life. I never imagined the human heart is capable of experiencing such an intense feeling of happiness, warmth and carefree. And I doubt there will ever be. Those two magical nights made me feel so ALIVE, yet in a better state than real life. Maybe it's Brian and Roger's age, maybe it's the once-in-a-lifetime nature of the concerts, maybe it's because Freddie was there, maybe it's me hitting low and stuck in life, in contrast to the feeling of how wonderful life is and I will live the best out of it after the Glam Nation Tour, Queen+Adam had brought me to a place of what could be that is so much better than real life and I don't ever want to leave. But that may be one of the reasons I ( and so many others) flew across oceans and continents to see them live. As Oscar Wilde once said, we all live in the gutter, but some of us look up in the sky. Well, these shows are just calls to forget about the gutter for a moment and enjoy the magnificence of the sky. Note: This is a very long recap, but well worth the read. 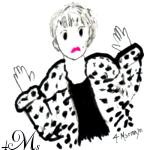 Note from seoulmate: Author is Oddlyood from Atop. With singer Freddie Mercury unavailable and bassist John Deacon uninterested, guitarist Brian May and drummer Roger Taylor’s decision to keep milking the Queen cow seemed based more on stubborn, out of touch egos than legacy burnishing. Not any more: not after last night’s London debut of Queen + Adam Lambert before an audience including Bob Geldof, Channel 4’s Phil Spencer, Black Sabbath’s Tony Iommi and Matt Lucas. For the first time since Mercury’s death in 1991, Queen look energised. Chastened by two patchy tours and one dismal album with uncomfortably stiff vocalist Paul Rodgers, May, 64, and Taylor, 62, have gone for broke. Yet, recruiting an American Idol loser young enough to be their grandson, suggested karaoke rather than renewal. Tellingly, feeble ticket sales forced the humiliating cancellation of 2012’s Sonisphere festival which they were scheduled to headline. Despite everything, even Lambert’s Jedwardian quiff, gold has been struck. 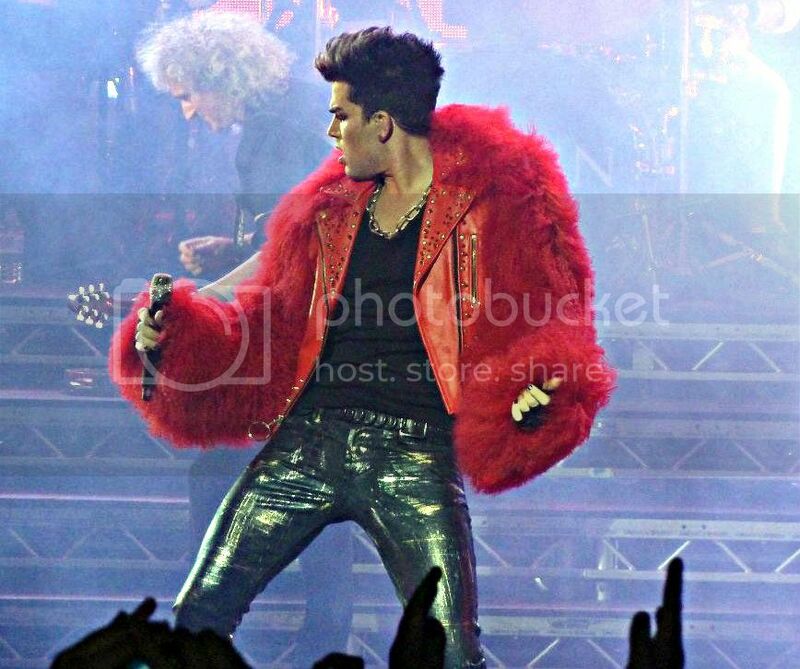 Dressed initially in leather and tinsel, Lambert understands Queen. 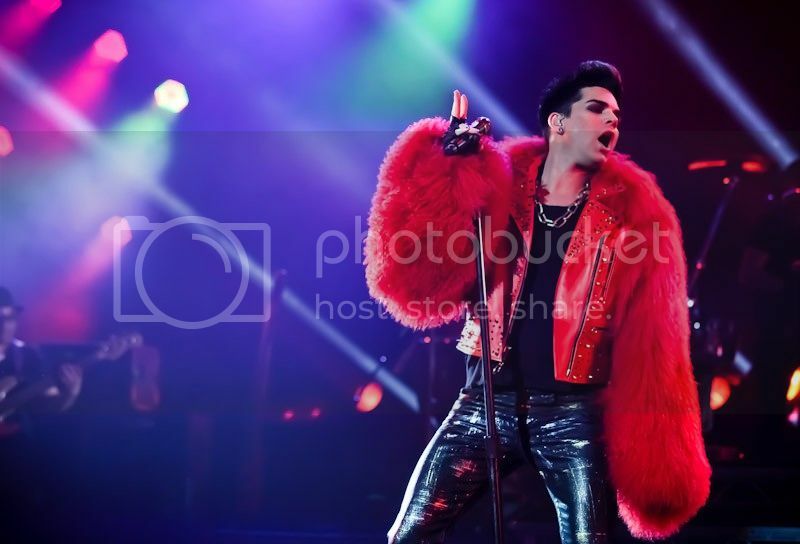 He embraced the ludicrousness of the ghastly We Are The Champions as willingly as the chunky funkiness of Another One Bites The Dust and Radio Ga Ga’s sweetness, but he also grasped that, innate daftness notwithstanding, Queen rocked. So he threw himself into Keep Yourself Alive, the fearsome I Want It All and a thrillingly speeded up We Will Rock You, which made an unnecessary encore reappearance at its original pace. Lambert sizzled, but when he left May and Taylor to fend for themselves, the evening sagged. May may have the startled air of a man caught trying on Germaine Greer’s hair, but his acoustic interlude was dreary and his guitar solo interminable. A ruddy faced version of Terry Venables these days, Taylor might have left all the singing to Lambert and his drum solo in the garage. 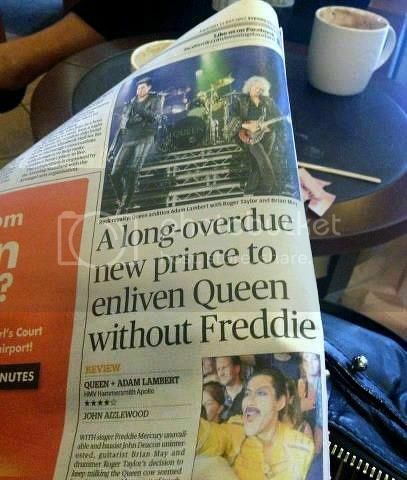 Still, such are the whims of men repeatedly (and correctly) described by Lambert as “rock royalty”. 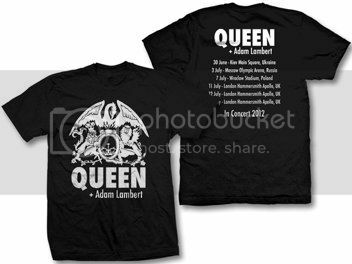 If May and Taylor have an iota of common sense left, they will sign up Lambert for the long live haul and a new album. 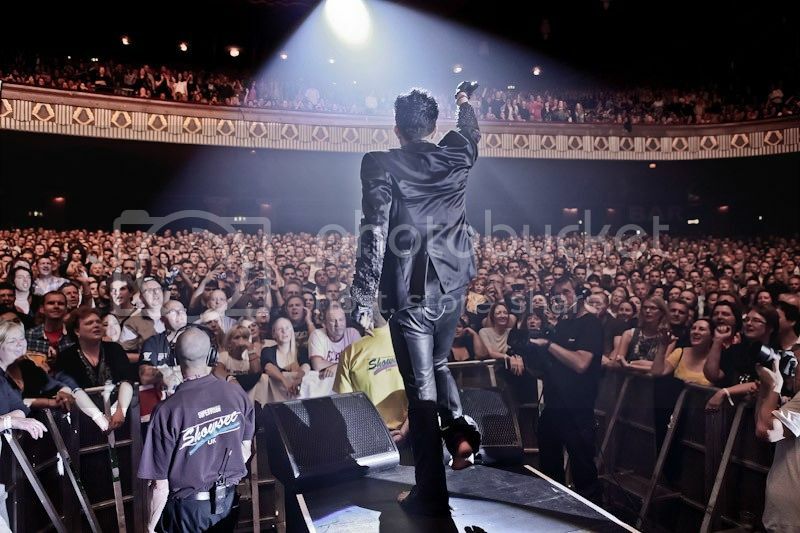 Queen + Adam Lambert play HMV Hammersmith Apollo tonight and Saturday: 08448 44 47 48.